For 15 years, Skillastics Activity Kits have provided team building activities for kids as an innovative twist on traditional circuit training. Currently, over 10 million children in more than 25,000 educational and recreational settings throughout the world are enjoying Skillastics’s kinesthetic learning activities. These cooperative learning activities consist of developmentally appropriate exercise games that are fun and educational. But don’t just take our word for it. Below are 30 reasons provided by our customers why they love Skillastics and find value integrating it with their PE Curriculum, Camp, or After School Programs. Students are so engaged they can’t focus on who is better at one skill or another. Can be easily modified and used in multiple ways. Allows us to accomplish our goals of getting kids active while letting them have fun with their friends during our Afterschool Program. The directions are clear for children to read and understand. We love that there are multiple skill levels in terms of repetition. Used as a teaching tool during a successful Administrator review. All students are actively engaged, having fun, and meeting the standards. Skillastics is all-inclusive. The non-athletic students fit in and becomes a part of a team. Substitute teachers love Skillastics because students are self-directed and fully engaged. 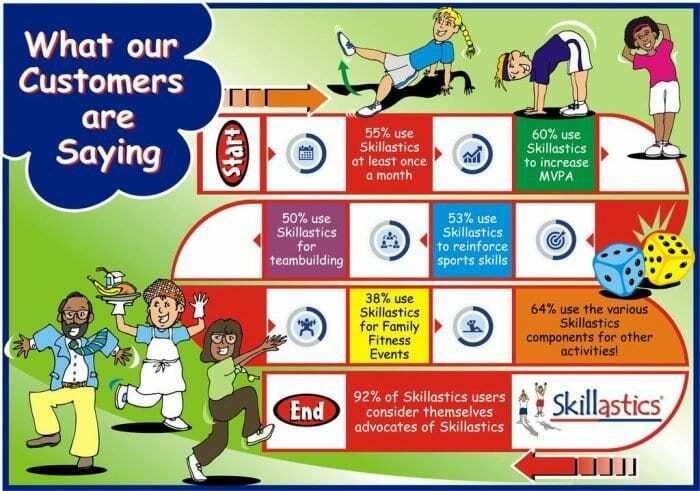 Skillastics Activity Kits help instructors understand and teach sport-specific skills better. Skillastics allows an overweight child a chance to excel and engage in physical activity in a fun, non-threatening way. Children have an opportunity to be noticed in a positive way. It’s not about showing off or winning a game, but more like having fun while becoming fit. Always moving, never standing still, which is a huge improvement from most typical games. With other activities, most students end up getting bored. However, with Skillastics it’s the complete opposite, because the students are always motivated to discover the next activity. Skillastics is a great tool for physical activity and sport skill development. These tools, coupled with the Skillastics reading, STEM, math, and nutrition components make it a great asset for any school. Skillastics is a great resource for students to get quality activities in a small space. I consider Skillastics a lifesaver. Skillastics creates a fun learning environment for students where they are building their physical, mental and social skills. Could not have been designed any better for physical educators and after school programmers because it’s easy to use, can easily be adjusted according to class size, and can be used in a number of ways. Allows instructors the flexibility to create an all-inclusive environment for all class sizes. Efficient and effective way to measure movement via heart-rate monitors or pedometer’s. The Skillastics technique automatically creates integration because students must read, count and communicate. The Skillastics equipment can be incorporated into other games and activities. Effective indoor recess activity. Turns this type of day from being sedentary to moving non-stop with Skillastics. Skillastics Activity Kits are completely developmentally appropriate. Any school at any level can benefit from Skillastics. This resource is truly a great modernization to the old “roll out the ball” routine. Innovative, original and most importantly AFFORDABLE! Physically student’s endurance, stamina, flexibility and coordination are strengthened. Socially student’s teambuilding skills are enhanced. Their relationships become more positive, and it’s helped improve their communication with others. Intellectually, Skillastics combines movement with STEM, Math and Nutritional content and questioning that’s so much fun! See for yourself and visit our Shop!